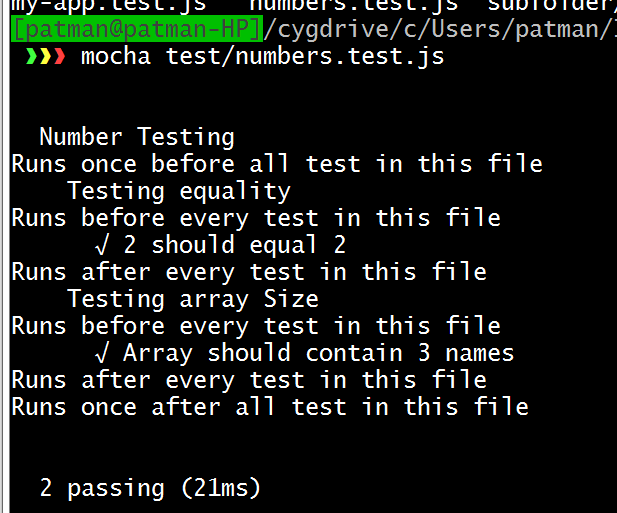 I also set up mocha with chai to do my TDD testing see http://www.whiteboardcoder.com/2015/04/intellij-and-nodejs-setting-up-tdd.html . I want to see what mocha's equivalent to the JUnit methods setUp() and tearDown(). Basically what methods are available to me in Mocha to set up the environment or variables before running a set of tests and what is there to remove those setups afterwards? For a one time set up that runs once before any test is run, use before. For a one time tear down that runs once after all tests have run, use after. To run before each test use beforeEach. To run after each test use afterEach. Here is some test code I made to show how it works. It's as easy as that, nice job mocha guys.